As if Linfield fans didn’t know already, Paul Smyth reminded everyone just why he is rated one of Irish League football’s rising stars. The winger headed the crucial first goal at Dungannon as the Blues maintained their perfect start to the new campaign. Smyth, who turns 20 next month, has been linked with a move to EFL Championship side Queens Park Rangers. But he put all the speculation to one side by playing his part in another impressively efficient performance from the champions. The game was in the balance for 20 minutes, but once Smyth headed home the opener, it was only going one way. 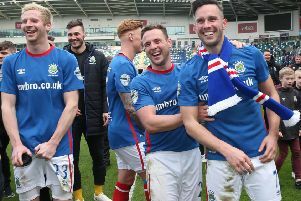 In the end Linfield ran out four-goal winners, leaving the Swifts rock bottom of the table. For the third straight game David Healy fielded the same side. Dungannon, meanwhile, recalled ex-Linfield winger Paul McElroy, with Grant Hutchinson also starting. The opening exchanges were even enough, with few clear-cut chances at either end. But then an injection of urgency from the Blues carved open the home side. Chris Casement played a searching ball from the right and Smyth got in front of his marker at the back post to head home. Peter McMahon came close to equalising for Dungannon but fired straight at the goalkeeper. The Blues, buoyed by Smyth’s goal, took a stranglehold on the game. A free-kick in a dangerous position outside the box gave them another sight of goal, and led to their second. The ball was cleverly touched off to Niall Quinn, who came racing in to thump home a first time rocket of a shot. Dungannon’s hopes of ending a wretched run in this fixture - they have won just one of the sides’ previous 21 meetings - were fading fast. And conceding a third on the stroke of half time sounded the death knell. Quinn fired in a corner which was met by Mark Haughey, although his header deflected off Seanan Clucas and will surely go down as an own-goal. Linfield’s fourth came with two minutes remaining - the only incident of note in a dire second half. A tug on Mark Stafford by David Armstrong inside the box was spotted by referee Keith Kennedy, who gave the spot kick. Goalkeeper Stuart Addis did get a touch on Andy Mitchell’s penalty, but it wasn’t enough to keep the ball out.